Echogear apparently thinks the axiom “For everything, there is a purpose” should be “For everything there are two purposes.” The company’s Outlet Shelf is a working example. Why should an electrical outlet just supply electricity? Why not wrap a shelf around it to hold the thing you’re supplying electricity to? It’s a genius idea, even if it’s not quite as practical as the company’s photographs make it look. 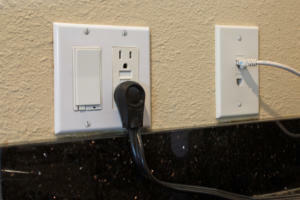 I say that because Echogear shows all kinds of gadgets plugged into outlets mounted in the middle of the wall. But the outlets in most homes are closer to the floor. I have several dozen outlets in my home, and only one of them is in the middle of the wall. And that’s because I told the contractor who built the house to put it there for a small water feature that hangs on the wall. This was my preferred location for the Outlet Shelf, because I have a Wi-Fi mesh point here. But the granite backsplash nixed it. The only other outlets that aren’t a few inches above the floor are in my kitchen, wet bar, and bathrooms, but they have granite backsplashes beneath them and the Outlet Shelf wouldn’t fit. 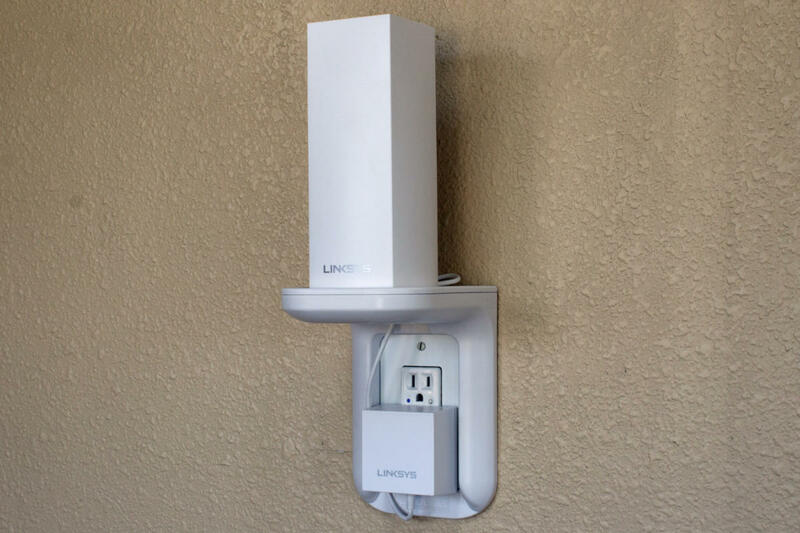 I really wanted to put the Outlet Shelf at my wet bar, because I have a Linksys Velop mesh point there (yes, I finally retired my old router. I picked the Velop because it supports hardwired backhaul, and there’s an ethernet port at my wet bar, too). But in addition to the presence of that backsplash, there’s a Z-Wave dimmer switch installed in the same junction box, and the Outlet Shelf will only work with single-gang boxes. It would have worked on the box where phone and ethernet jacks are installed, but Echogear doesn’t offer a cover plate with those types of cutouts. Still, the Outlet Shelf is an awesome solution for getting smaller home electronics off your countertop, dresser top, entertainment center, or wherever they’re taking up space. This could be a small wireless speaker, like the Sonos Play:1. Or a smart speaker, like the Amazon Echo or Google Home. Or a Wi-Fi access point, a home security camera, or even battery-powered devices that need charging—be it a smartphone or a small power tool. For some things, it doesn’t matter all that much where your outlet is located. But for speakers—especially smart speakers that have built-in directional microphones—a few inches above the floor is just not going to cut it. This Linksys Velop mesh point fit perfectly, with plenty of room for me to coil and zip-tie the excess power cable, which I hid behind it. Echogear provides steel outlet covers (one duplex and one Decora style) to replace your typically plastic existing cover and longer-than-typical machine screws. You remove the existing cover (yes, you’ll need to give up anything decorative), place the shelf over the outlet, and then screw on the cover plate to hold the plastic shelf to the wall. The long screws help to ensure the weight of the shelf and whatever you put on it (you’re limited to 10 pounds) doesn’t pull them out. 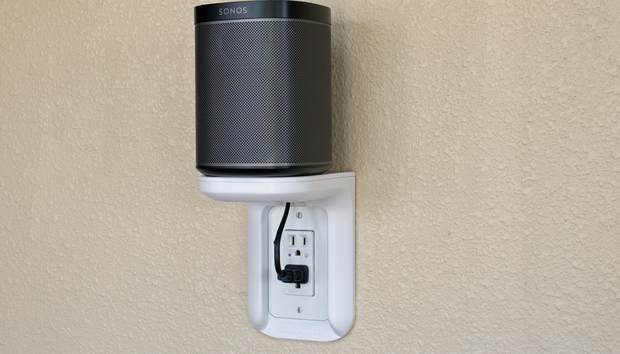 I tried the 4-inch-wide by 5-inch-deep Outlet Shelf with a Sonos Play:1 speaker, an Echo Dot, a full-sized Echo, and that Velop mesh point. The photos on Echogear’s website are little misleading here as well. There was plenty of room behind the Echo and the Velop to coil the excess power cable, secure it with a zip tie, and hide it behind the device (there’s a hole in the bottom of the shelf for the pronged end of your cable or a wall wart). It was a little tight behind the Play:1. The speaker is stable, but right on the edge, and there was no way to hide excess cabling behind the Echo Dot—it’s just too short. There was plenty of room between the Outlet Shelf’s legs to fit the AC adapters I had, even the bulky one that came with the Velop—but anything larger than that will be a problem. 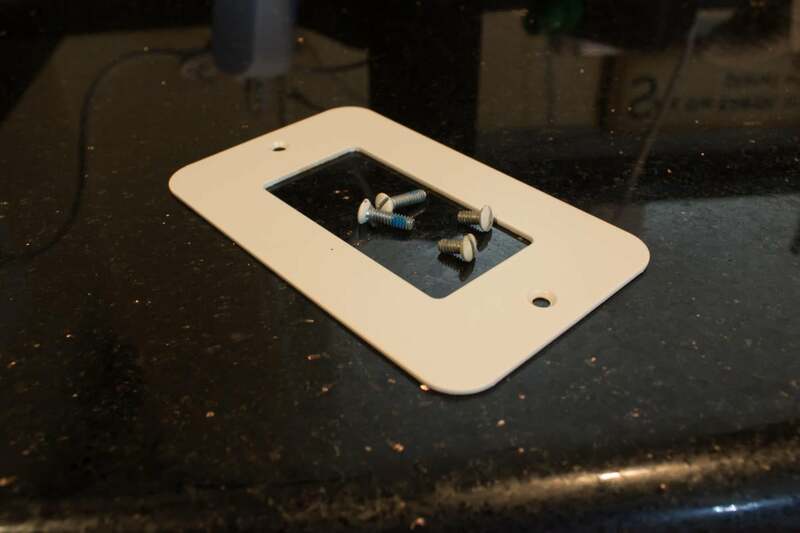 Echogear provides a steel outlet cover (Decora style, as shown here, and old-school duplex) and two extra-long machine screws to secure the shelf and cover to the outet. The Outlet Shelf is innovative, and at $15, it’s a very inexpensive product. I like it a lot. But consider what you’re intend to put on it and where you want to install it before buying one. You’ll need at least 1.75 inches of space between the bottom of your outlet cover and the top of anything that’s beneath it, be it a backsplash, a chair rail, wainscoting, or what have you. And while no one’s going to stop you from putting a speaker, smart speaker, Wi-Fi access point, or anything else 18 inches above your floor, you won’t get the best performance from those devices there.